Roasting eggplant brings out a whole new dimension to this versatile kitchen staple. 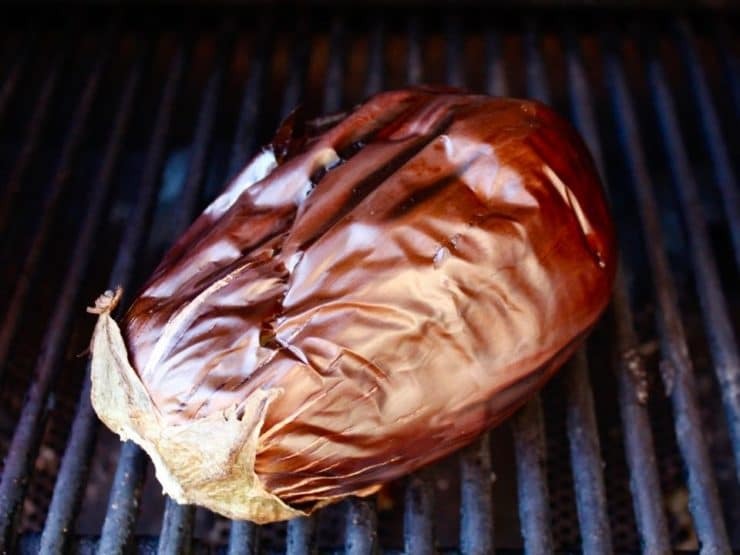 In this post I will walk through the best methods for roasting a whole eggplant on a gas range, grill, or in the oven. The techniques each results in smoky, tender eggplant pulp that is full of flavor. The eggplant, also known as aubergine, has been cultivated in India for over 4,000 years. Eggplant is a fruit– in fact it is technically a large berry, although most cooks generally consider it a vegetable. The eggplant, also known as aubergine, has been cultivated in India for over 4,000 years. The oldest surviving mention of the fruit dates back to the 5th century in a Chinese agricultural work called Ts’i Min Yao Shu. It later made its way to Persia in the 4th century CE, where it eventually became firmly rooted as a major part of the Middle Eastern diet. Eggplant is an affordable, healthy dietary staple that can be prepared in numerous ways. 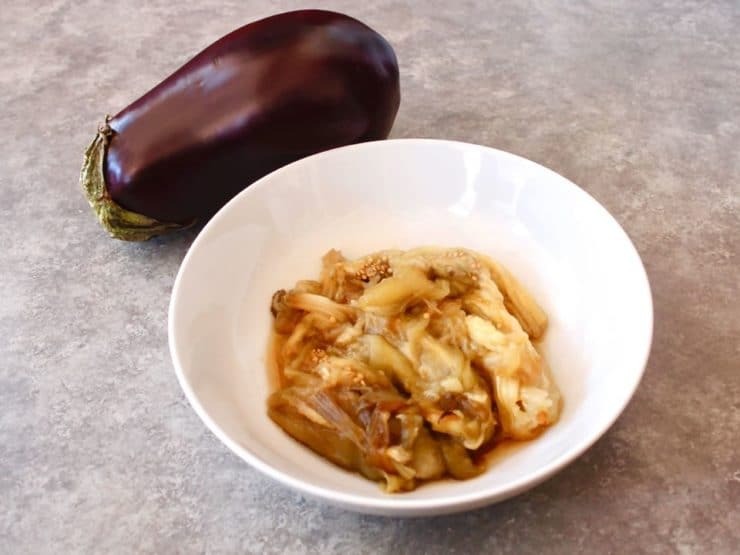 During a second Jewish expulsion from Spain and Portugal in 1580 (when the two countries united under one crown), eggplant became known as the “Jew’s apple” because of its frequent usage in Sephardic Jewish cuisine. Once you know how to roast an eggplant, there are a number of dishes you can make with it. In this post I will share my favorite methods for roasting eggplant, along with some tips for ensuring a tasty result every time you roast. I prefer roasting eggplants on the gas stove or grill. Roasting on an open flame imparts a delicate smoky flavor into the eggplant flesh. 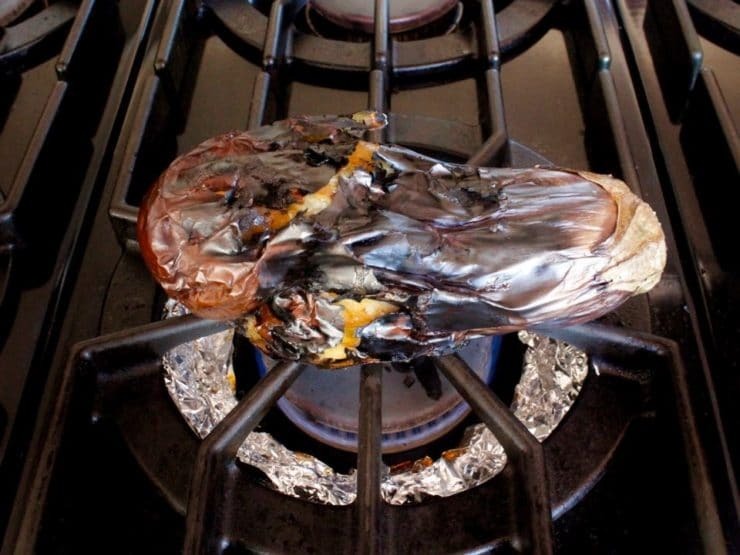 If you do not have a gas stove, you can also roast it in the oven. Both methods are described below. Detailed step-by-step tutorial for roasting eggplant with flame, on stovetop, in the oven, on a grill or on a grill pan. Wash and dry eggplant. Pierce it a few times with a fork to vent. Important - for any of the cooking methods outlined below, make sure you pierce with a fork-- otherwise you could end up with an exploded eggplant! If you have a gas range, you can roast it directly on top of the range. 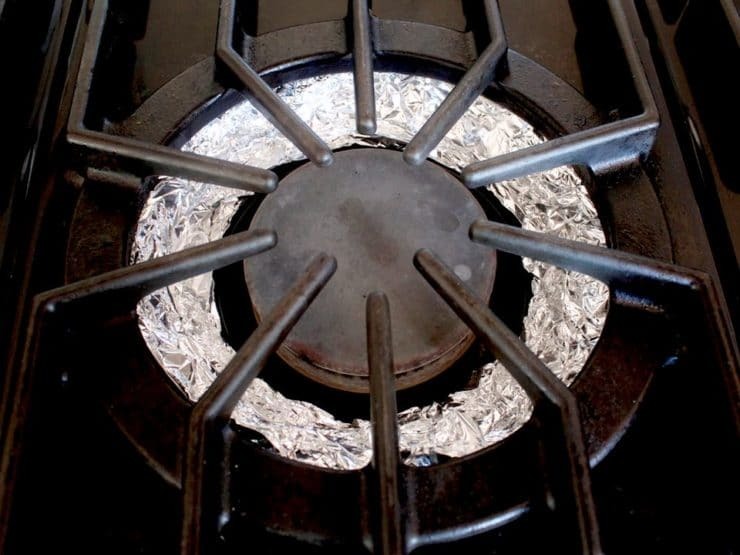 You might wish to protect your gas range burner with a layer of foil, which makes for easier cleanup. The eggplant will weep a bit as it roasts, leaving charred bits and goop on the range. 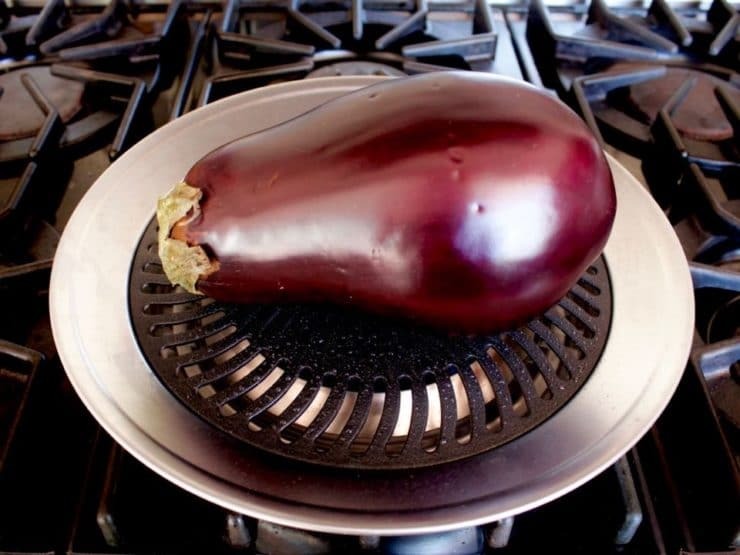 Place eggplant directly on top of the gas range grate. On my gas stove, I usually turn the flame to medium. Allow eggplant to roast over the flame for 20-30 minutes, giving it a quarter every 5 minutes as it cooks. The larger the eggplant, the longer it will take to roast. Smaller eggplants (like Japanese eggplants) will roast faster. 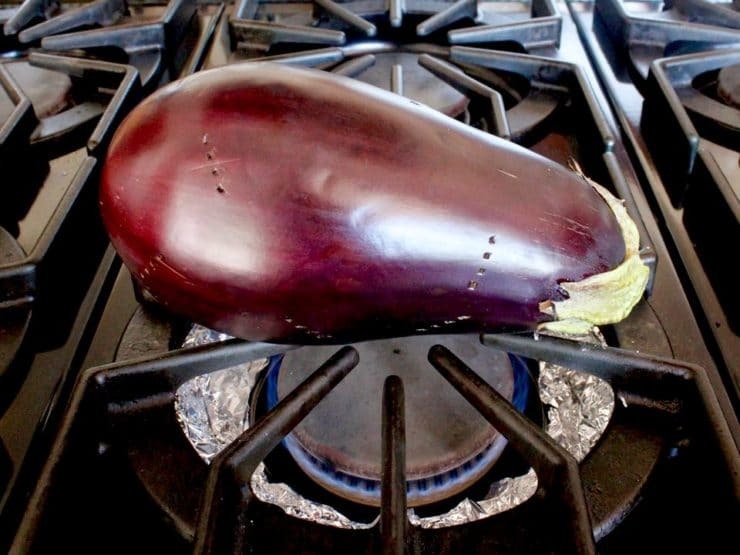 When finished cooking, remove from oven and proceed to "Peeling Your Eggplant." 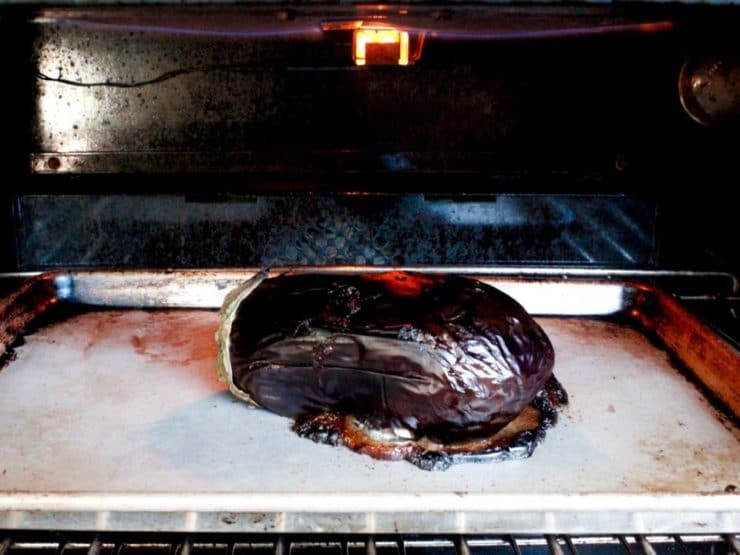 If you have an electric range, or if you want to protect your gas range from the mess, you can use a grill pan to roast the eggplant. 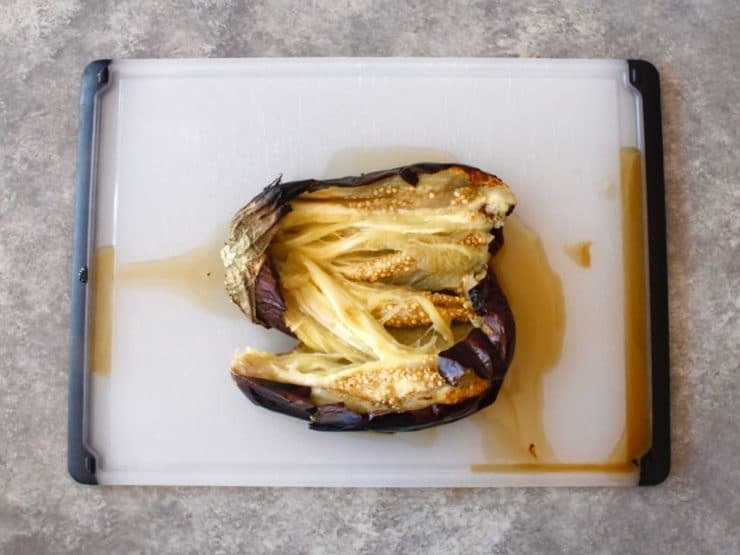 A grill pan will protect your stove from the drips of roasted eggplant juice. Here is the one I use - <a href="https://www.amazon.com/gp/product/B002W2Q4OK/?tag=theshiintheki-20">Grill Pan</a>. Prepare <a href="https://www.amazon.com/gp/product/B002W2Q4OK/?tag=theshiintheki-20">grill pan</a> according to instructions. My pan requires a bit of water to be placed in the circular chamber. 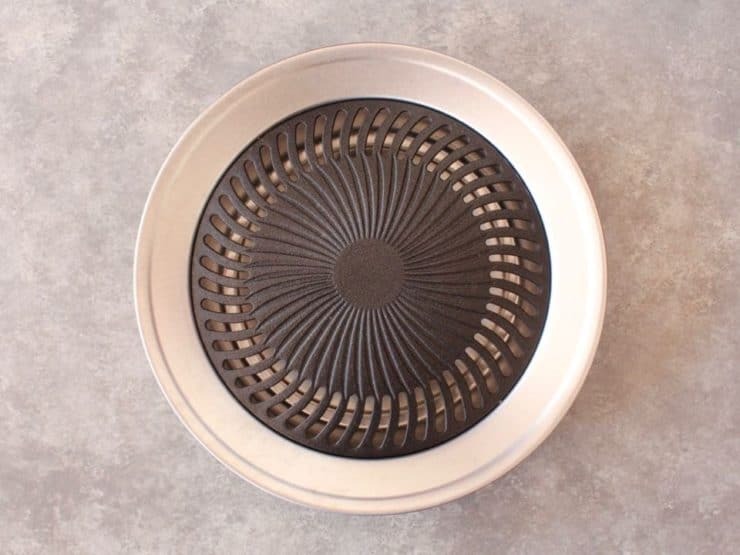 Preheat grill pan over medium heat; brush lightly with oil if it is recommended for your pan. Pierce the eggplant a few times to vent, then place on the preheated grill pan. Roast the eggplant for 40-50 minutes, giving a quarter turn with a pair of tongs every 5 minutes or so, until the eggplant is charred and collapsing. Check water level about halfway through cooking if your grill pan requires it. 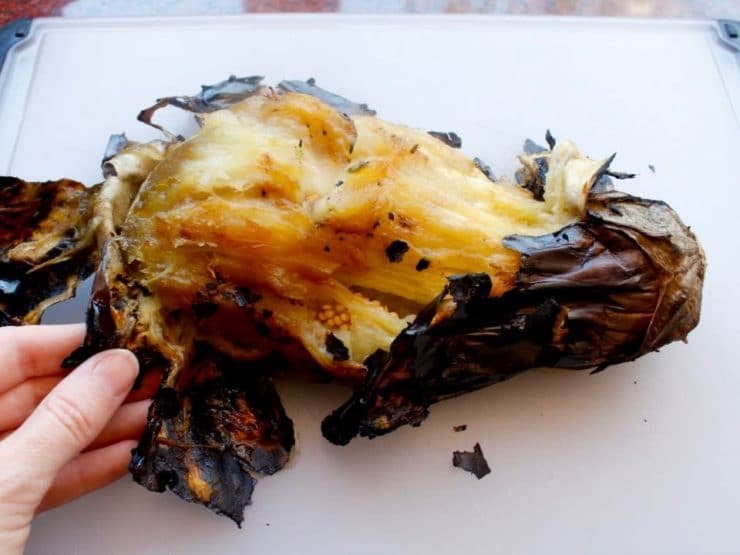 When eggplant is tender, charred and collapsing, remove from grill pan and proceed to "Peeling Your Roasted Eggplant." If using a grill, light gas or coals and preheat the grill to medium heat before you begin to roast. Allow eggplant to roast over the flame for 20-30 minutes, giving it a quarter every 5 minutes as it cooks. The larger the eggplant, the longer it will take to roast. 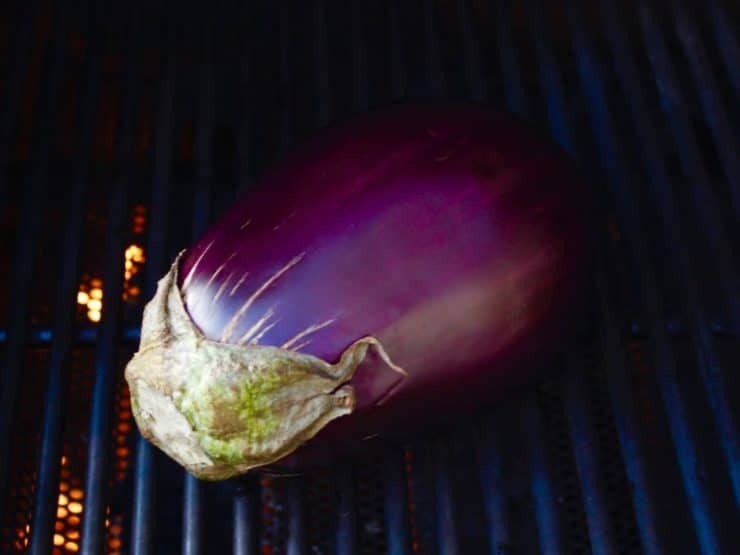 When eggplant is tender and collapsing, remove from grill and proceed to "Peeling Your Roasted Eggplant." Place a rack 8-9 inches beneath your oven's broiler and preheat the broiler. Lightly grease a baking sheet with cooking oil. Wash and dry eggplant, then pierce a few times with a fork to vent. Place on a baking sheet under the broiler and let the eggplant roast for 20-30 minutes, giving a quarter turn every 5-7 minutes. Eggplant is finished roasting when it is soft, tender and collapsing. Remove from oven and proceed to "Peeling Your Roasted Eggplant." If you encounter a bitter eggplant, you will want to halve it and salt it prior to cooking. The method for salting is described below. Once salting is complete, this is the way you roast it. 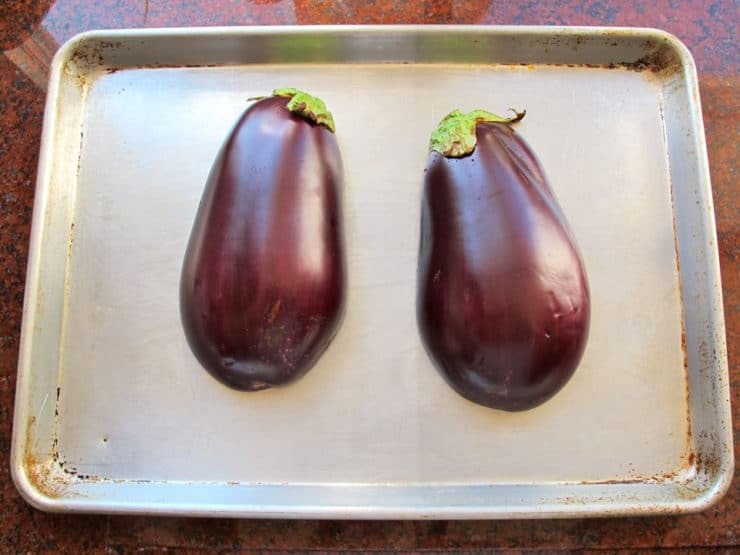 Place eggplant halves flesh-side down on a lightly greased baking sheet (so the flat cut side is directly against the baking sheet). Roast 8-9 inches underneath the broiler for 20-30 minutes until the eggplant halves are charred and the halves are beginning to collapse. The larger the eggplant, the longer it will take to roast. Smaller eggplants (like Japanese eggplants) will roast faster. Remove from oven. Check the eggplant flesh to make sure it is soft, roasted, and caramelized throughout. If any parts looked light-colored or undercooked, return to the oven to roast for a few minutes longer. Scoop out the roasted pulpy flesh from each half and place it in a bowl. Discard the charred skin. There will be some residual smoky juice that collects in the bowl; you can drain it off or blend it into the eggplant, depending on the flavor you want to achieve (see Eggplant Roasting Tips, below). Once the eggplant is very tender and collapsing, remove from heat with tongs and place it on a cutting board. There will be some residual smoky juice that collects on the board; you can drain it off or blend it into the eggplant, depending on the flavor you want to achieve. Slice the eggplant open. Scoop out the roasted pulpy flesh and place it in a bowl. Discard the charred skin. The eggplant will be quite soft, and you may need to peel off a few small bits of skin by hand. I'm not super careful about it; I find that a few charred bits actually enhance the smoky flavor, which we find desirable. Once the eggplant is separated from the charred skin, you are left with perfectly tender, roasted and smoky eggplant flesh, which can be used to make baba ghanoush or a variety of purees and dips. If you are concerned about bitterness, choose smaller, younger eggplants for roasting. The younger and more slender the eggplant is, the less bitter and stringy it will be. If you slice the eggplant in half prior to roasting, you can salt each half to combat bitterness. Sprinkle an even layer of salt across the white flesh. Let the eggplant sit for 30 minutes. Liquid droplets will form on top of the flesh. Rinse off this liquid, which can contain bitterness. Pat dry. Proceed with roasting. If you slice the eggplant in half prior to roasting, there may be some large visible seeds inside. You can scrape out the largest ones using a small spoon; these larger seeds tend to hold bitterness. 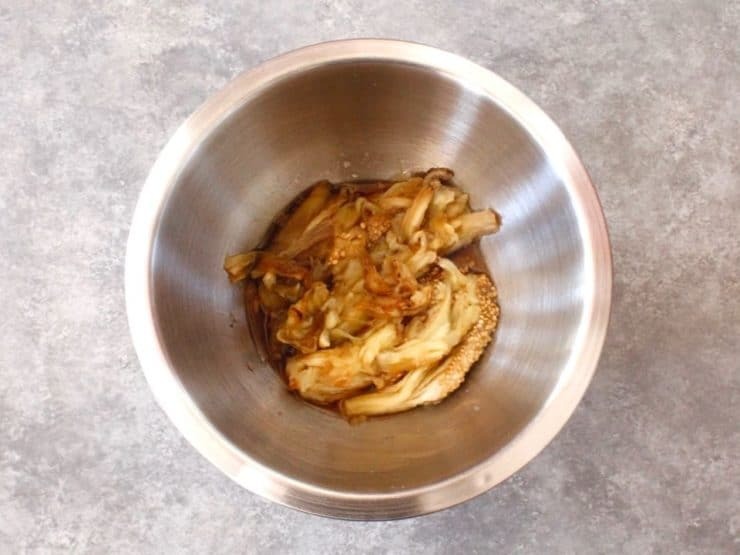 After roasting, remove the eggplant pulp and let it rest in a bowl for at least 30 minutes. A smoky liquid will collect in the bowl. Taste the liquid; if it has a bitter taste to it, drain the liquid and discard before proceeding with your recipe. Personally, I very rarely encounter the bitterness issue. I prefer to roast the eggplant whole (it produces a smokier more charred result), keep some of the smoky juice from the roasting and add it to whatever dish I’m making—it imparts fantastic flavor to dips like baba ghanoush. Tori! This is absolutely amazing! I have never really known what to do with eggplant or how to feel about it. Every time I have made it I would consider the flavor “just okay” but this method of cooking has changed that forever! I used the broiler method to make your recipe for baba ganoush and could have eaten the eggplant by itself! The baba ganoush turned out great as well but I must say I will be eating more eggplant from this day forward! Wow obviously I am ecstatic. Thank you for the recipe. Starting with my Father we have been growing Black Beauty Eggplant in our Brooklyn garden for over 50 year. Watching my Mother she cooked the Eggplant on the stove top in a Potato Baker. Turning it until all sides are charred and soft, no stove cleanup. Spooning out and removing any LARGE seed pods to lessen any bitterness. Once it was mashed with a fork, Olive oil, Garlic powder and diced Onion was added. We eat it on sliced Wheat Bread with Mayonnaise and sliced Tomatoes, also from my Brooklyn garden. I never investigated making baba ghanoush before and didn’t realize how much went into the cooking of the eggplant. I have read the comments and like your method best. Seems wasteful to discard 11 pounds of salt after making one eggplant. I have tried and do love the dish. I think my electric oven will get a workout with the broiler soon, once the heat of the season evolves into cooler fall weather. Thank you so much! i will try your methods and see how they work. My last attempt failed, my eggplants became dry in the oven and despite i cooked it for more than a 1.5 hours they stayed hard. I think it happened because i made to many holes with a fork and all the juices flashed out. Easiest method of cooking eggplant right (not saturated with oil) that I’ve found so far. Currently I’m using it as a filling for eggplant lazagna. I’ll try the ganoush next time. Interesting recipe/method, and one that I will try. Although I’m not (yet) a Jew, I do plan to convert and will most likely be adopting Sephardi minhagim, so you recipe blog is a real help as I’m already trying to follow kashrut. One variation necessary is that, in Australia, most stoves, whether gas or electric, have a separate compartment for the griller (we call it a griller and grill our food, whereas in he USA it’s a broiler and you broil the food. Broil has a quite different meaning here). Thank G-d that you include pictures as I now know that I need to put the eggplant , as we here would say, “under the griller”. Thank goodness I found your comment. I thought the same thing and glad your comment clarified it for me. 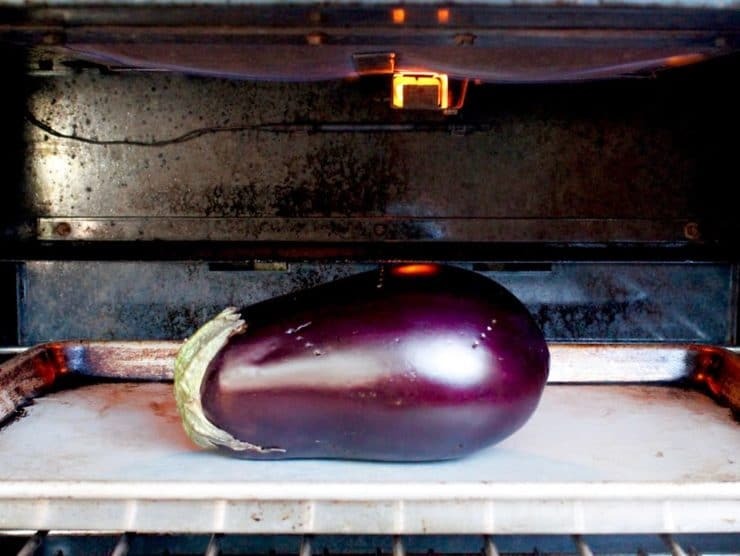 I am trying to roast a couple of fairly large aubergines in a toaster oven – over 2hrs now and still not smushy 🙁 Am growing to loathe my toaster oven but renting an apartment in China and not many other oven options. I have successfully tested another alternative. Although there is a gas stove where I live, it’s a shared house and my roommates would kill me if I roasted an eggplant on an open flame. We don’t have a grill, the stove is very old and wrecked, and its oven is not operational. But I was determined to make baba ganoush and I had an idea. You may have heard of the millenia-old Chinese technique of cooking in salt – yes, actual pure dry salt powder, lots of it! The Chinese typically roast a whole chicken in salt, but the same technique can be used to cook or roast just about anything. Salt doesn’t melt at ordinary cooking temperatures, it doesn’t burn, and it conducts heat very well, so a large mass of heated salt can almost mimic an oven. This method is also very much energy-efficient. Actually, this method is particularly good for beef, because the salt absorbs the steam as the meat is heated, and that forms a hard, impermeable crust that seals the rest of the moisture inside. This makes even cheap, harder beef cuts tender and moist. This method only works for large chunks of food and not for chopped bits, as the latter would obviously become too salty, but if the pieces are large enough (like a whole cut of beef, a chicken or an eggplant), the food doesn’t get salty at all, because the steam pressure pushes the salt out. At most, you may need to wash a few salt grains off the surface afterwards. Actually, after whatever you’re cooking is done, you will need to salt it as usual! So, I did that with eggplants this time. You will need a large pot with a working lid. The pot should NOT have nonstick (Teflon) coating, as it gets extremely hot, that damages the Teflon and makes it release noxious fluorine fumes. And you will need LOTS of salt – depending on the size of the pot, as much as 5 kg (approximately 11 pounds). It doesn’t need to be coarse salt or any special type – any kind of salt will do. You only need it as a heat delivery method, it won’t be ingested and it will be discarded in the end anyway. First take the empty, clean, dry pot, and completely cover the bottom with a generous layer of salt (about 1 kg or 2 pounds just for that!). Then place the eggplants on top. The eggplants need to be WHOLE and undisturbed, not even pierced with a fork as indicated in the article. Then literally bury them in salt until you can’t see them. Place the covered pot on the stove and set it to high. Large eggplants should be cooked in 30-40 minutes, but you want to leave them there for an hour or longer for the sake of flavor. Some descriptions of the salt method say that it should be good when the salt on top is cracked, but I’ve found that this is not a reliable indicator (regardless of what you’re cooking) – ignore that and consider the time. When cooking eggplants in salt, the dyes from the skin may leach to the salt and make part of it blue, purple, or pink. Don’t panic, that’s normal. After it’s done, you can just discard the salt in the garbage bin (or if cooking meats, perhaps keep some of the “dirty” salt to season something else). The result was very good with eggplants. I would still recommend the open-flame method if it’s feasible for you, because while the salt method does impart a characteristic flavor, it’s very mild and not really smoky as some recipes (particularly baba ganoush) require. If making baba ganoush after using the salt method, I’d recommend that you keep some of the skin to enhance the flavor. But for people with limited heating options in their kitchen, this method is much better than using the microwave or giving up the recipe altogether. Note that this could be done even over a campfire. Thanks Tory, You are wonderful, I learnt a lot from you, the recipes. I am sure my wife, children, family and friends will love it. Thank you so much. Your taste is excellent. I grow eggplants my own. Hi David, thanks. There is still some debate in the scientific community about this issue, however I have cut back dramatically on my use of foil through the past couple of years as a precaution. This is an older post on my site. Now I generally flame-roast it without the foil. It is messier and the stovetop cleanup is a pain, but it gives a brilliant smoky flavor due to the burned skin and no fear of leaching. You can also use the grill if you prefer, no foil required. I just tried it on top of my gas stove. Worked like a charm. I’ll be using it in my vegan stuffed dolmades recipe..Thanks for this easy tip! East Indian Dish from eggplant is made from roasted Eggplant. The roast is flavourfull if done in open charcoal fire- it otherwise woks too. After roast remove skin and temper in oil and mustered seeds and add salt, garlick, lemonn juice and a pinch of sugar and termerick. If you like fresh chillies just a little bit. You can enjoy this with Chappatis , rice or any other dish. For a shortcut you can roast( just cook) egg plant in micro wave covered in a glass dish. I came here looking for information about how to roast an eggplant without oil and found it. Now I’m even more inspired to try this out. Thanks for the info! By the way, my first try at zacusca was a great success! I plan to try using it as a sauce for zuchinni “noodles” and maybe an eggplant lasagna. In India , we make it as a side dish with a special stuffed bread ! Very rich in flavor . I mash the roasted eggplant with roasted tomatoes and then add chopped garlic n onion , salt , green chili n chopped cilantro and a dash of mustard oil ! You can also add some roasted or boiled potatoes to it . It tastes awesome !! You got a pretty cute and fat eggplant there. I also use my smoker box in my grill to easily add the smoky flavor to it. Awesome tip by the way! traditionally in south India the eggplant is drizzled with little oil and then put on flame(gas stove or charcoal) and turned periodically till the outer skin is blackened. To avoid bursting we use to make small pricks with fork or knife. Finally. Now I can roast eggplant and make baba ghanoush. Next best thing to chocolate. Seriously. I am roasting eggplant as we speak. I have an electric stove, so generally do it on a cast iron griddle. Today I’m trying the oven. I am a fan of the smoky flavor, and found, quite by accident, if you freeze after roasting (leave it in the skin), it intensifies the smokiness. This method of roasting on the stovetop gave me a headache. Our stove fan does not vent to the outside, so maybe that’s why. I am curious if anyone else had this problem or could speculate why this would happen. Until then, I think I’ll stick to oven roasting. Thanks for this great breakdown. I wanted to make baba ghanoush but too late remembered that I have no gas range, only an electric oven! Very handy technique, and a good flavour (if not as good as doing it properly over fire). Thanks! Thank you for the step-by-step description. I find that when I go to take the skin off – its a bit challenging to detach and also that at that point, the eggplant is so mushy/soft that its hard to cut into cubes as suggested. Any suggestions? Note that if you need cubes that are both skinned and roasted, you should peel the entire eggplant before cubing and roasting. Hope that helps! In our little Jerusalem apartment we have no gas grill and no oven. Could we use an electric hot plate or in our crockpot? Thanks for any suggestions. 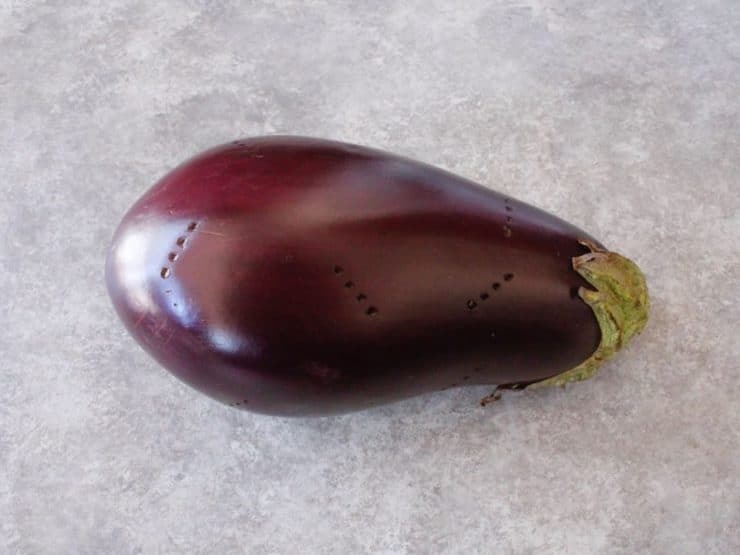 Hi Cathy, I don’t think a crockpot will work, I’m not sure it would get hot enough to really “roast” the eggplant (though you could try it on high for a couple of hours as an experiment!). A hotplate might work, but I can’t say for sure… I haven’t used a hot plate since college! Do you have access to an outdoor grill or a grill pan? That would work better. Thank you for this instruction. I’ve only baked eggplant, but now will do the on-the-burner method. hi..i was thinking of one can roast potatoes similarly on the open gas in the same way like eggplants. I’ve tried whole potatoes on an open firepit, which works great, but never on the stovetop. If you’re using whole potatoes on a gas stovetop it will take a long, long time to get them cooked. I’ve never tried it so I can’t really advise you, sorry! Hi Roberta, I think you had your flame on too high. Try roasting on a lower heat setting next time. Also, try heavy duty aluminum foil (it’s a bit thicker than the regular kind). The foil may burn/char a little in hot spots, but it shouldn’t catch fire. You’ll have multiple layers around the eggplant, so even if one layer chars through you’ll have a couple more protective layers in place. Turn it more often to be extra careful, so it doesn’t get too hot in any one area. Re: photos, I don’t use flash, and I try to use natural light whenever possible. I made the roasted eggplant. It was smooth and sweet. My hubby loved it too! That’s an accomplishment! Thank you! I would like to roast the eggplant as you suggested. My challenge is that I am allergic to tomatoes and sesame. Any other options for its use? I will try the dressing idea. I cannot eat dressings either that are bottled or vinagrettes, yep, allergic. Thanks for any additional ideas to use the roasted eggplant. I have an organic garden and grow lots of eggplant. Appreciate any great uses. Thanks my mother made the eggplant with chopped green peppers and olive oil and a little vinigar. It was used as a dip. I would like a recipe with tomatoes if you have one. IT ALWAYS TURNS OUT DELICIOUS. .
Can you eat the eggplant plain after roasting or do you have to make something else out I it? 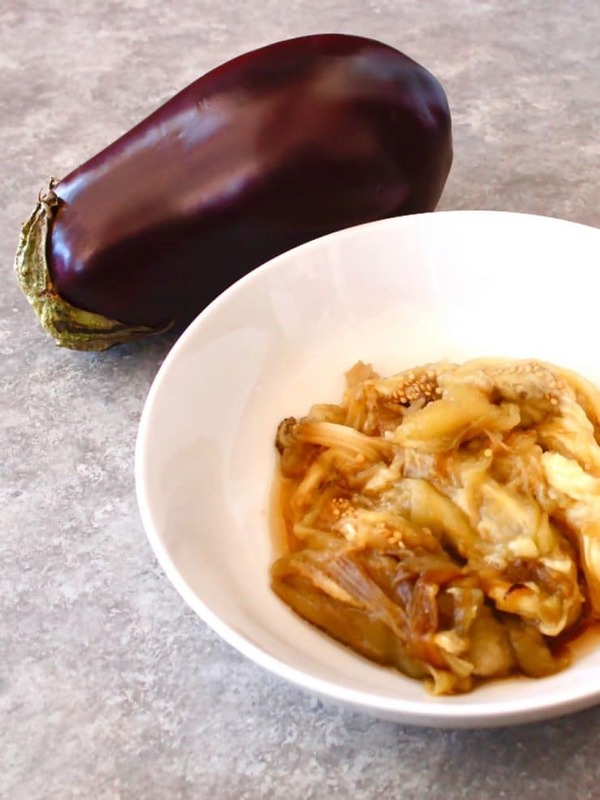 Hi Lisa, you can eat the eggplant plain– my husband and I sometimes make a main course out of simple roasted eggplant when we want a dinner that is light on calories. It’s pretty boring all on its own, though, and the texture after roasting is somewhat mushy (it doesn’t bother us, but others may object). I would suggest dressing it up with some sort of sauce, at the very least. We like ours with sriracha (spicy) sauce, or tahini sauce with fresh chopped cilantro or parsley. Thank you. I love eggplant but knew the smokiness needed to come from roasting. I will be trying this tonight on the grill. Do you have any recipes with curry? Thank you so much for sharing your gas-range roasting method! 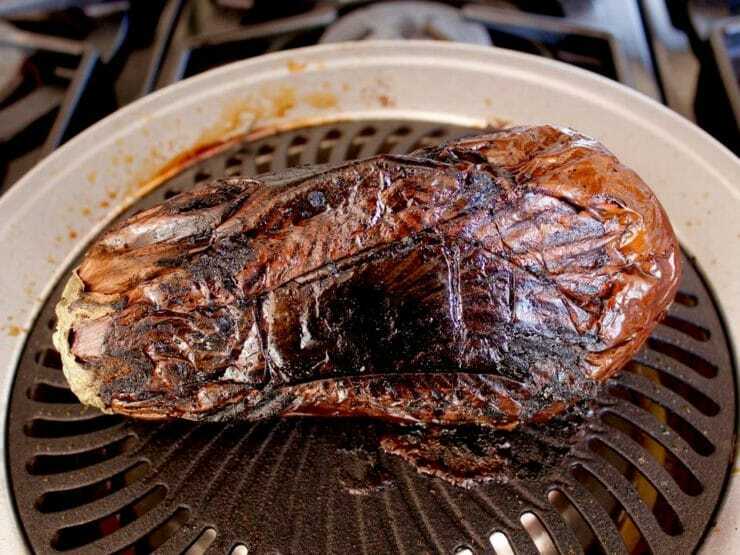 Do you broil with the oven door open or closed? 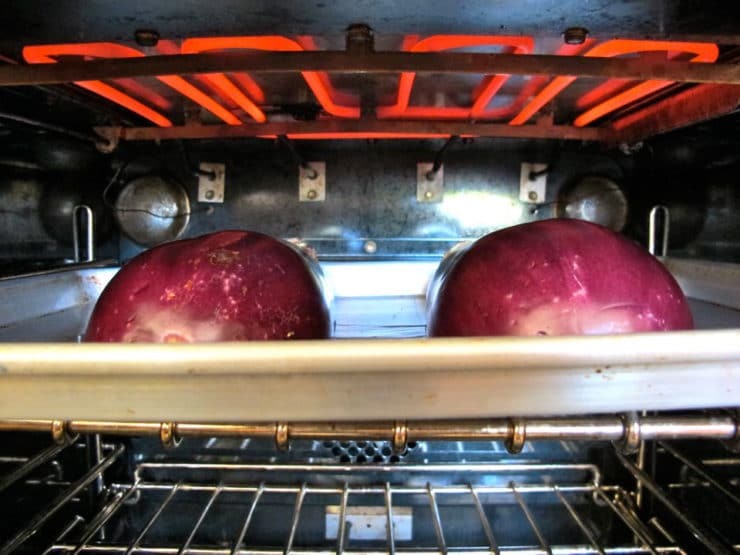 It looks like your eggplant is about 4 inches from the broiler – is that about correct? Does this method tend to smoke up the kitchen? My gas grill tends to cook at about 550 degrees F with the lid closed and all 4 burners on high – do you leave your lid open or closed? HI, One way to avoid bitterness is remove all the seed pods after roasting. The bitterness is in the seed. Also, choose male eggplants instead of females. Finally, I find the best flavor comes from the long slender Japanese style eggplant, they have less seed and tend to be less bitter. Master this roasting , smoky technique to make Ajvar, and other Pepper/Eggplant blends. Enjoy. Thanks so much for this tutorial. I’ve roasted peppers on the stove and never thought of using the technique with eggplant. This is perfect because I did not want to turn on the oven, and the result was a fantastic, very smokey eggplant. So happy you liked the technique Diana! I roast eggplant this way 2-3 times per month, at least. So healthy and yummy! I found a Lebanese restaurant near where we live and it does the best Baba I’ve ever tasted! I’m so excited I’m going back for dinner tonight, I want to try everything on the menu! I can never get that smokey flavour at home but I have an electric hob (yuck) and I don’t have a grill. I’ve tried the broiler oven but it’s not the same.Guess I will have to just eat out more often, yay! I used to be able to get a roasted eggplant dip with a tomato-based sauce, not baba ganoush, at Pesach time. Do you have any good recipes for that ? There are many tomato-eggplant dips, I actually have a few recipes. I’d need more details– was it on the sweet side, salty, or spicy? Did it have bell peppers in it? well, that figures lol it’s been a couple of years since I was able to find it, but I remember it being on the sweeter side, large chunks, but no peppers in it. perfect on Tam Tams. I would welcome any recipes you have, including spicy and salty. I have eggplant growing in the garden and would love to have a variety of recipes of a warm weather treat. So that’s the secret! Now I can try eggplant casserole. The only times I ever had it was in a cafeteria back in Colorado. That’s just too long! I roast an eggplant or 2 approximately every other week. I share some with my parents after chopping it up with a touch of olive oil if it’s on the dry side. It makes a great salad dressing and has a lot fewer calories and is much healthier than the store’s bottled dressings. We roast it weekly here on the home front. My husband likes it as a light meal with a bit of salt and sriracha chili sauce. Super spicy, but oh so good! Hi Karin — could you elaborate a little on how you make the roasted eggplant into a salad dressing? I’m winging it right now. Creaming it up in my bullet and about to add some garlic and a teeny amount of olive oil. Any other seasoning? THis sounds intriguing. Thank you in advance. Thanks for the tips. I’m looking forward to that smoky flavor mine has lacked so far. I’m also looking forward to tomorrow’s recipe. Thanks! Wonderful. Then what do you do with it? I’ll be posting a recipe for baba ghanoush (roasted eggplant dip) later today, Victoria. Adding a few cloves of crushed garlic does wonders for this dish. We have it regularly with bread or pittot. I struggle with trying to achieve the smoky flavor. I’ve tried oil, no oil, hot, cool, split in two, whole. I’ve tried indoors and on a wood grill. Occasionally I get that deep smoky flavor, but usually I get a tender and pleasant eggplant but lacking in smoky flavor. Any idea about what helps the smoke flavor to develop? I find that the smoky flavor comes from the charred outer skin. If you like the smoky flavor which i Do for my Bahba Ganoosh . Make sure the skin chars a little or alot…. Thank you so much…now all I need is a recipe to use the eggplant in.